PARIS --- Ending 33 years of direct competition between Eurofighter and Rafale, and renewing a lapsed defense industrial alliance between their two countries, the French and German defense ministers in Berlin on Thursday signed agreements launching three major defense programs. 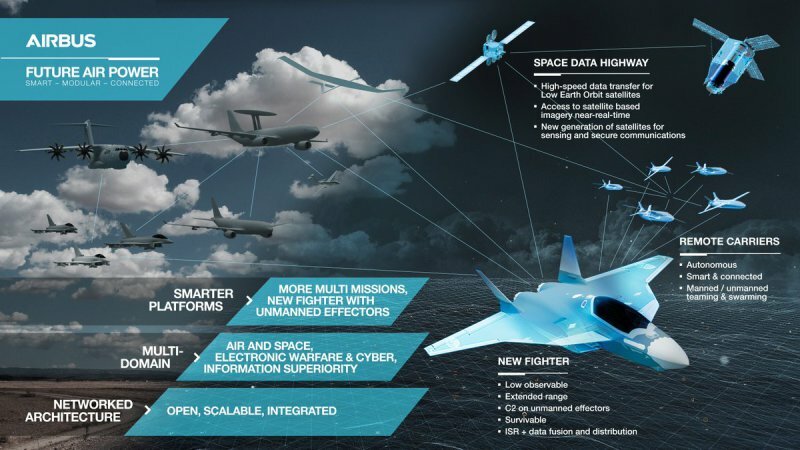 The agreements -- covering Future Combat Air Systems (FCAS), a European MALE drone and Future Maritime Airborne Warfare Systems – commit both countries to bilateral development and production of common manned and unmanned aircraft, binding them together for several decades to come. Two of the three are initially launched bilaterally, with the promise that additional partners will be able to join once performance and design are frozen, while the third, the European MALE UAV, is multilateral from the outset, with both Italy and Spain as risk-sharing launch partners. “FCAS will revolutionize combat and our equipment, and allow more ambitious investments and innovations. FCAS means more powerful and more operational forces,” French Armed Forces Minister Florence Parly said during a press conference after signing the agreement. Questioned about the difficulties encountered in previous projects, such as the A400M airlifter which has racked up delays, cost overruns and technical difficulties, the two ministers said they had learned from past errors. “We have imperatives not only in terms of sovereignty but also of respecting budgets and schedules,” Parly was reported as saying by Agence France-Presse. "We made mistakes, and we've learned from our mistakes," von der Leyen added, according to a report by Deutsche Welle radio. "That's why we have decided that for joint projects, the first thing we will do is make sure that we speak with one voice. That means that with every project there will be one lead nation. Second point: regardless of how many countries take part, there will be one design, one set of requirements — and no national specifications." FCAS is undoubtedly the biggest development in European military aviation since France broke away from the Eurofighter program in August 1985 to develop the Rafale on a national basis, a move that preserved its know-how in the field of combat aircraft and their engines while the Eurofighter partners shared theirs. This is one reason for which the two ministers agreed that France’s Dassault Aviation, although far smaller than Airbus Defence and Space, would lead the FCAS program. “When there is cooperation, nations must decide, and there is always a lead nation….for FCAS, it will be the French,” German Defense Minister Ursula von der Leyen said during an April 26 press conference at Berlin’s ILA air show, where she signed the agreements with Parly. Reciprocally, Airbus and Germany will lead the European MALE drone project. Dassault was chosen to lead FCAS for its demonstrated expertise in designing and producing advanced combat aircraft closer to budget and to schedule than any Western competitor, to its know-how in designing complete combat aircraft, and to its “lean and mean” business approach. The French requirement that the FCAS be capable of operating from an aircraft carrier also played a role, as Dassault has already demonstrated its know-how in this field with the Rafale-M carrier variant. Speed record for European cooperation? As unprecedented aspect of these new agreements is the speed with which they have been concluded, as the decision in principle to cooperate was only taken by French President Emmanuel Macron and German Chancellor Angela Merkel in July 2017, barely nine months ago. It is also remarkable that, in the same short time, the two nations’ air staffs were able to agree on the FCAS specifications, allowing French Air Force Chief of Staff General André Lanata, and General Bühler, the German Air Force’s Director-General for Planning, to sign a "High Level Common Requirement Document." (HL CORD) for the FCAS program. And, perhaps even more surprisingly, Dassault Aviation and Airbus Defence and Space agreed to cooperate on the program and set the basic principles, allowing them to sign a cooperation agreement on April 25, also at the Berlin air show. It is without a doubt the first time in the annals of European defense cooperation that two governments, their military staffs and their industrial partners have agreed to launch a joint military program in as short a time, let alone one as ambitious and complex as FCAS. Based on experience, similar programs in the past have taken years, not months, to reach a similar point, with more often than not time-consuming interruptions, backtracking and arm-twisting. But, as noted by Airbus DS CEO Dirk Hoke, “The schedule is tight, so we need to start working together immediately by defining a joint roadmap on how best to meet the requirements and timelines to be set by the two nations. It is therefore of key importance that France and Germany launch an initial joint study this year to address this task” -- which also is a reminder to the two governments to provide initial funding. While the Berlin signing ceremony showed all-round agreement on the FCAS, one major issue has so far been studiously avoided in public: exports. While France has a comparatively liberal arms export legislation, Germany’s is far more restrictive. Likewise, German public opinion generally opposes arms exports while France’s is more likely to approve, so it is important that export rules be defined for all FCAS components. This preoccupation has been sidelined for the time being, but will necessarily soon surface in Germany, as Merkel’s coalition allies are far more opposed to arms exports than were her previous government partners. The issue was originally resolved by agreements signed in 1971 and 1972 by the two countries’ then defense ministers, Robert Debré and Helmut Schmidt, in which each country vowed not to block the export by the other of military equipment developed in cooperation. This principle could be renewed for FCAS and other programs, or the agreements could be considered still valid, but one way or another the export issue will have to be resolved before development work is contracted out. What are the implications of FCAS? The first implication of FCAS is that European cooperation is alive and kicking after two or three decades singularly lacking in ambition in this respect. And, again, the political impulse is now so strong that all the agreements in principle on the governance of FCAS were agreed in nine months, making it unlikely that any slippage in schedule or cost will be tolerated. A second implication, which will be welcomed by many Europeans, is that Germany’s emphasis on defense sovereignty has virtually ruled out its acquisition of the Lockheed F-35 as a possible successor to its Tornado strike fighters. Ursula von der Leyen has always appeared hostile to this option, and has fired the German air force chief of staff for supporting it in public, but Germany’s institutional position is now clearer. Although the United Kingdom, with which France was developing a separate program also known as FCAS but covering an unmanned combat aircraft, does not yet have a role in the French-German program, it has not been cut out. “In parallel, we will continue Franco-British work that is complementary to the Franco-German approach and we will see, when they have reached a sufficient maturity, the terms of integration into the [French-German] SCAF project. All this will have to be negotiated with our partners,” the paper adds. What the briefing paper does not say, but which is clearly implied by French officials, is that the United Kingdom’s large share in the F-35 Joint Strike Fighter program, as well as its withdrawal from the European Union, do not plead for its inclusion in what France and Germany clearly consider a major European sovereignty program. Sweden’s Saab, maker of the Gripen lightweight fighter and Europe’s only other designer of fighter aircraft, is “closely following the [French-German] process, and not closing any doors,” company CEO Håkan Buskhe said during an April 26 press conference in Stockholm on the company’s financial results. A Saab spokeswoman denied second-hand reports that Buskhe said Saab was interested in the FCAS: “that is taking it too far,” she said this morning by telephone. The French briefing paper describes at some length the requirements and goals of the FCAS project. Rather than paraphrasing it, we reproduce here our translation of its salient points. (To avoid confusion with the Anglo-French project of the same name, we have retained below the French designation (SCAF) instead of using FCAS as in the rest of this story.) The entire paper is posted in our Word for Word section. The future air combat system aims to succeed the current fleet of combat aircraft (Rafale - Mirage 2000 / Tornado - Eurofighter). It will revolve around a piloted component, missiles, highly-connected drones able to act either autonomously or within a system of systems, in order to face the challenges of future operational environments. -- As of today, a Franco-German common vision of the operational need related to the replacement of the Rafale (FR) and the Eurofighter (GE) by 2040, a necessary step before any variation of the industrial aspect. -- Takes into account the challenges of the operational environments of the future. -- The need is to replace the Rafale and Eurofighter fleets. The system will therefore have to be versatile and flexible to use. It will have to be able to act autonomously, or within a system of systems, in order to face the challenges of future operating environments. -- SCAF will have to meet the requirements of all air-to-air missions. -- The survivability of SCAF will enable it to cope with all future threats. -- The future air system must be interoperable with NATO and EU assets in a framework of offensive and defensive operations. -- SCAF will need air superiority capabilities in the face of future air threats. -- SCAF must be able to engage all targets of interest for air surface operations. -- The SCAF must be able to act in a disputed air environment and engage all types of air defense systems. -- Increased need for connectivity and real-time data merge capability. -- The SCAF (French particularity) must be able to be navalised.